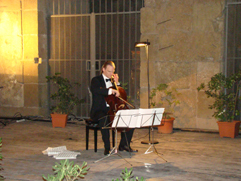 You are invited to cello recital "Tartini's L'Arte dell'Arco in the Interpretation of František Brikcius", held on Sunday 25th September 2011, 4pm, at the Benedictine monastery of Rajhrad (Klášter 1, Rajhrad, 664 61, Czech Republic). Czech Cellist František Brikcius will be playing "L'Arte dell'Arco" (The Art of Bowing), 50 variations written by baroque composer Giuseppe Tartini (*April 8, 1692 Piran/Istrie - †February 26, 1770 Padova) on the theme of Corelli's Gavotte in the transcription of Paul Bazelaire (*March 4, 1886 Sédan - †December 11, 1958 Paris) for cello solo. Entry is free - raised money will be used toward the reparation of the monastery. In the cooperation with the Benedictine monastery of Rajhrad, the City of Rajhrad and the Ora and labor foundation. More details on websites http://www.Brikcius.com http://www.Rajhrad.cz/OraEtLabora , http://www.Rajhrad.cz/Benediktini and http://www.Paul-Bazelaire.com . "TARTINI'S L'ARTE DELL'ARCO IN THE INTEPRETATION OF FRANTIŠEK BRIKCIUS"
What is the name of the house where are held concerts "Brikcius in Řetězová"? Contest is over, lucky winners are J. S. from Prague and G. N. from Berlin. Benedictine Abbey Rajhrad built on the site Moravian settlement that Duke Břetislav I. gave the year 1045 Brevnov monastery. Three years later he founded a Benedictine monastery was the first monastery in Moravia. Until the end of the 17th century the monastery was basically in Romanesque style. Major reconstruction of the monastery in the Baroque style was launched in 1721 according to a recent project by Jan Blazej Santini-Aichl, but he soon died. After 18 years, 7 June 1739, the church was consecrated. At its construction and the building followed the convent. The entire complex was built until 1840. Emperor Francis I promoted 22nd March 1813 Rajhrad provost of the abbey. Modern history meant forty-break (1950 - 1990) monastery life. 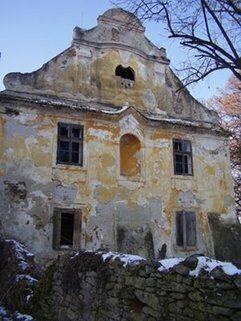 The monastery was returned in a poor state of the Benedictines in 1990 and was administrator of a monk. The community came here in 1997. Today there are 6 monks and the whole object is gradually restored. It houses a Museum of Literature in Moravia, which together with the abbey church accessible to the public. Benedictine Abbey Rajhrad is partner of project "Tartini's L'Arte dell'Arco in the Interpretation of František Brikcius". 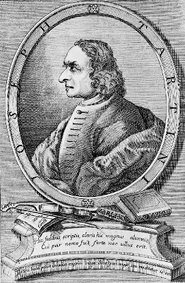 Italian violinist, composer, teacher, and theorist Giuseppe Tartini was born on 8 April 1692 in Piran, Istria. His father Giovanni Antonio Tartini, originated from Florence, was a successful trader and his mother Caterina Zangrando was a descendant of one of the oldest aristocratic Piranian families. Giuseppe learnt music and violin at the Capo d'Istria and in 1709 he attended the University of Padua where he studied law, theology, philosophy and literature although his father preferred he enter the Franciscan priesthood. He also studied the art of fencing in which he later became a master. After his father's death in 1710, he married Elizabeth Premazone, two years older fellow student and a niece of bishop of Padua. The couple kept their marriage a secret for three years but once discovered, cardinal Giorgio Cornaro, bishop of Padua ordered Tartini's arrest for abduction. Leaving his wife who was sent to a convent, Tartini fled Padua to go to the Monastery of St. Francis in Assisi, where he was offered asylum; while there he probably studied composition with the famous Czech musician Padre Bohuslav Černohorský and he took up playing the violin. Two years later, in 1715, Tartini was found by some pilgrims from Padua, and they told him his wife had been pardoned by the cardinal. With the charge against him also dropped, he emerged from his seclusion to return to his wife and perfect his violin playing with Gasparo Visconti in Cremona. In 1716 he heard Francesco Maria Veracini play at a musical academy in the Mocegino palace in Venice, and was so impressed by his style, especially by his bow technique, that he decided to perfect his own playing. From this time Tartini began his career as a composer, wrote his "L'Arte dell' Arco" (The Art of Bowing) and "Il trillo del diavolo" (Devil's Trill). Returning to Padua in 1721 Tartini was appointed "primo violino e capo di concerto" at the Basilica di Sant'Antonio in Padua, a position he held for the rest of his life. The proceedings of the appointments board expressly stated that Tartini was exempt from the usual examination because of his acknowledged perfection in the profession, and he was at the same time granted complete freedom to play in opera and musical academies whenever he so wished. Taking advantage of the permission he was granted, he took part in occasional performances in Parma (1728), Bologna (1730), Camerino (1735), Ferrara (1739) and, most frequently, Venice. In Padua he met and befriended fellow composer and theorist Francesco Antonio Vallotti and cellist Antonio Vandini. In 1723 Tartini was invited, together with his lifelong friend and colleague, the cellist Antonio Vandini, by Count Kinsky to Prague in performances connected with the coronation of Emperor Charles VI as king of Bohemia. Tartini remained as a member of Count Kinsky's orchestra until 1726. Then he returned to Padua, where he established a violin school "Scuola delle Nazioni". He took in student from all over Europe and many of the later 18th century's most famous performers were taught by Tartini including Pasquale Bini, Giuseppe Antonio Capuzzi, Carminati, Domenico Ferrari, Girolamo Asconio Giustiniani, Carl Heinrich Graun, Johann Georg Holzbogen, Pietro Lombardini, Pietro Nardini, Johann Gottlieb Naumann, Pasqualini. Tartini developed a style of bowing that is still practiced as a standard, and the influence of his compositions spread to France, England and Germany, but throughout the remaining twenty years of his life Tartini concentrated on his theory more than composition. Between 1739 and 1741 Tartini visited many Italian cities including Naples and Rome where he composed, at Pope Clement XII's request, his single composition for the church, Miserere, which was performed by the Sistine choir 1768. Tartini died on February 26, 1770 after a long illness. He was the first known owner of a violin "Lipinski Stradivarius" made by Antonio Stradivari in 1715. Both his birthplace Tartini's house and a statue of Tartini are located in the Piazza Tartini in Piran. 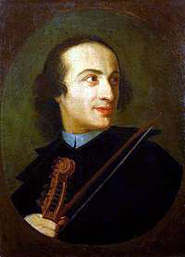 For more about Giuseppe Tartini visit http://www.Brikcius.com and http://En.Wikipedia.org/Wiki/Giuseppe_Tartini . Call for ... visit "Festival Žalosti"
Visit festival of alternative culture "Festival Žalosti 2011", held during the weekend from 9th till 11th September (postponed) in Jinín (Fara čp. 1, Jinín, Strakonice, Czech Republic). Festival will feature Czech cellist František Brikcius playing cello suites (J. S. Bach, M. Reger, G. F. Handel) in local church "Nanebevzetí Panny Marie" and programme "Prague - Brno: 6 Contemporary Composers for Cello solo in the interpretation of František Brikcius" (J. Matys, P. Hejný, J. Jirásek, L. Fišer, M. Štědroň and I. Kosíková) in baroque rectory from 17th century. 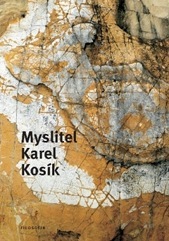 For more details http://www.Sklenobyl.cz .